The Final instalment of the Red Hook Crit is here and it is going to be mental! Top riders from around the world have gathered in Milano to see who will be crowned the king and queens of the fixed gear crit. 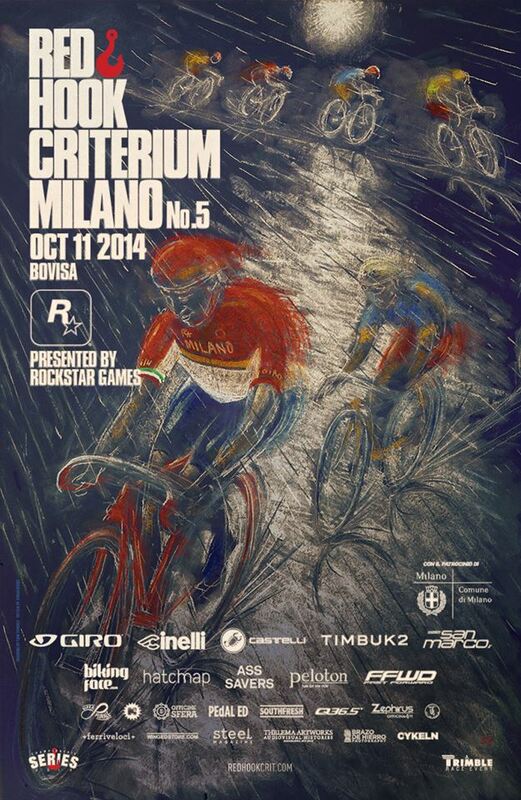 The are a number of fixed gear crits thought he Red Hook is the original, biggest and the won everyone want to win. It’s currently raining hard in Italy which could change the outcome of the race quite drastically, I am interested to see the results. I was meant to be racing though I have to cover the race for a UK based magazine and no matter how hard I tried to do both it just wasn’t possible. Work came first and I will be there cheering on the riders, especially my team; Dodici Cicli Squadra Corse. Stay tuned for a full write up and some photos from the event. Check out the awesome poster below dram by Sam Trimble, looks like he knew there would be rain!